A new book by former Antiquities, Monuments & Museums Corporation chief Keith Tinker, collates everything we need to know about regional migration to the Bahamas - from prehistoric times to the present. Tinker, 57, is a historian who led the AMMC from its inception in 1998 until last year. Before that he was a civil servant in the Ministry of Finance and the Department of Co-operatives, also teaching part-time at the College of the Bahamas. He holds degrees in history from West Indies College in Jamaica, Florida Atlantic University, and Florida State University. The Migration of Peoples from the Caribbean to the Bahamas was published last year by University Press of Florida. Unfortunately, although it is only 200 pages with no photographs, the hardback edition is expensive - over $70 retail - which will limit its accessibility. Tinker describes migration to the Bahamas from English-speaking countries in the West Indies since Emancipation. His interest was sparked by the relatively large West Indian presence here - Trinidadian prison overseers, Barbadian policemen, Haitian tailors, Jamaican teachers, Guyanese surveyors - and the lack of scholarship on the subject. He explores the influence of Spanish and British imperialism on Bahamian settlement since the 15th century, describing the indigenous population at the time of the "discovery'. The Lucayans (as they were called) were themselves uninvited immigrants, their ancestors having island-hopped through the region from South America, arriving here in the 9th century AD, when the Vikings were rampaging across Europe. There is no definite evidence of any earlier human population in the Bahamas. And after the unfortunate Lucayans were annihilated by the Spanish within a couple of decades, the islands were deserted until the arrival of English religious dissidents from Bermuda in the mid-1600s. This was the first of several waves of modern immigration, reaching forward to the present. Those waves of migrants included white and black American loyalists who arrived with their slaves in the late 1700s, Africans liberated from slave ships by the Royal Navy in the first decades of the 19th century, and a series of lesser known migrations from within the region itself - which form the main core of the book. These included Barbadians recruited in the late 1800s as constables to replace the West India Regiment troops stationed here, Turks Islanders who came to work in the lumber industry during the first half of the 20th century, West Indian artisans who filled labour shortages during the 1920s construction boom, increasing numbers of Haitian economic refugees from the 1950s, Jamaican teachers and Guyanese professionals recruited from the 1960s. Tinker places immigration to the Bahamas within a wider historical context of regional migration, explaining the influence of our close links with the United States in forming anti-West Indian sentiment. He also concludes that "an official process of social acceptance and systematic assimilation could begin to solve the Haitian problem" and build a Bahamian identity that is more in tune with current reality. After taking us through the familiar historical summary, Tinker offers some interesting insights into the experiences of immigrants, through little known anecdotes and interviews. Beginning in the 1890s, there were three small waves of Barbadian immigration. Those recruited as constables to replace the West India Regiment were at first the objects of distrust and animosity among black Bahamians, until the Police Act of 1908 successfully amalgamated the local police and paramilitary constabulary. During the 1920s, Barbadian artisans responded to opportunities created by the tourism and real estate boom of the prohibition years, working on the construction of new hotels, private homes and public projects. They contributed substantially to the apprenticeship system under which many Bahamians were trained. The late politician, Sir Clement Maynard (father of Senator Allyson Maynard), was the son of one of these immigrants - a builder who came here after working in Panama and Cuba. The third group were recruited as police and prison officers in the 1950s, and many subsequently transferred to other sectors of the civil service. Tinker reports that "the Barbadian experience in the Bahamas exemplified an unassuming modesty in the face of obviously significant contributions" to the development of their adopted country. Jamaican immigration also became prominent in the 1920s, with most coming from Cuba but others from the Canal Zone. Some were recruited as policemen, including the father of Sir Lynden Pindling, the first prime minister of the independent Bahamas. But many others entered illegally and were routinely deported after the economic boom collapsed in the 1930s. Some 1800 workers were employed on the construction of the New Colonial Hotel in the 1920's, and most of the West Indians were Jamaican. Tinker reports that these men organized strikes when they learned that Cuban workers were being paid more for the same work. And Jamaican immigrants also helped to facilitate Marcus Garvey's appearance at a large political rally in Nassau in 1928. During this time the government recruited a number of Jamaicans as agricultural trainers, including a horticulturalist named Leonard Jervis who organized the agricultural research station and plant nursery near Fort Charlotte, which later became the Botanic Gardens. Today his grandson, Tony, is a leading preservation architect in Nassau. But most Bahamians will want to read this book for the comprehensive background it provides on the Haitian migration to the Bahamas - from the 1700s onwards. "Until the 1950s, migration between Haiti and the Bahamas represented a reciprocal and constant flow of human traffic," Tinker says. After 1804, when the Haitians achieved the first successful slave revolt in history, a number of white and coloured refugees resettled in the Bahamas for one reason or another. Among the most successful were Edward Laroda and Stephen Dillett, who became the first non-whites to be elected to the Bahamian House of Assembly - "monumental accomplishments" in a period when slavery had only just been abolished. In the late 1800s Haitians began a small but constant migration to the southern Bahamas in search of work, and the Bahamian presence in northern Haiti was also high during this period. Some Haitians in the southern islands married Bahamians and produced families, two notable issues being our current governor-general, Sir Arthur Foulkes, and the acclaimed actor Sidney Poitier. Other common Anglo-French names like Bodie, Deleveaux, Dupuch, Duvalier, Godet, Moree and Marche attest to the large Haitian influence in the Bahamas. 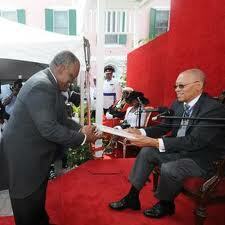 There is even a strong belief that former Haitian dictator Francois Duvalier was born in the southern Bahamas. The modern phase of Haitian immigration began in the 1940s, when some 5,000 Bahamians were recruited to work in the US seasonally, replacing Americans fighting overseas. A Haitian consul was appointed in Nassau in 1948, as Haitians flocked to fill jobs left vacant by Bahamian migrants to the US. In 1955 Tinker reports that relations between Haiti and the Bahamas were cordial enough for Tribune editor Etienne Dupuch to lobby both governments to include Nassau in then Haitian President Paul Magloire's international tour. But Bahamian attitudes towards Haitians quickly hardened. Sporadic round-ups and deportations began in the late 1950s - coinciding with increasing political instability in Haiti. As we became more prosperous and conditions worsened in Haiti under the Duvalier dictatorship, the familiar pattern of thousands of Haitian boat people seeking a better life in the Bahamas took hold. By 1960 the Tribune was referring to this influx as an "invasion". In 1963 a new immigration act specifically targeted Haitian migrants, increasing penalties, giving immigration officers police powers, and requiring Haitian vessels to officially enter the Bahamas at Matthew Town, Inagua. But when the predominantly black PLP replaced the predominantly white UBP regime in 1967 the talk turned to regularizing and integrating Haitians rather than expelling them. Critics accused the PLP of seeking to create sympathetic Haitian voting blocs in out island communities - a charge which continues to be made today on both sides of the political divide. This liberal attitude was short-lived, however, as the scale of popular anger against the migrants became clear. After the PLP's re-election in 1968, the government began to crackdown on illegal immigration, with systematic raids on Haitian communities and interception of Haitian sloops at sea. By this time, even Premier Lynden Pindling was referring to the influx as an invasion. In 1973 the independence constitution restricted the eligibility of many children born of Haitian and other foreign parents in the Bahamas to claim citizenship. As a result, Tinker says, "Many young Haitian-Bahamians became traumatized by their preclusion from participation in local social, economic and political activities." We are seeing the consequences of this play out today. Tinker also points to Bahamian complicity in this supposedly unwanted migration. "Many demand increased repatriation exercises, yet continue to hire the illegal aliens to perform menial tasks at low wages. It appears that as long as the Bahamas remains stable and Haiti continues to experience political and economic maladies the 'Haitian problem' will persist." After Haitians, Turks Islanders are the largest group of West Indian immigrants to the Bahamas, mostly due to the fact that the two countries are geographically united and socially identical. This migration began on a small scale in the 1890s when men were contracted at Long Cay and Inagua to work on freighters sailing from the US east coast to the Caribbean and Central America. Some also found work in the salt industry at Inagua, but most Turks Islanders were recruited to work in the American-owned logging industry, which began in the early years of the 20th century. By 1953 the logging camp at Pine Ridge (where Prime Minister Hubert Ingraham was born) was the largest community on Grand Bahama with a total of 1800 workers, most from the Turks & Caicos. In 1968, the new PLP government discontinued unification talks with the Turks & Caicos and enacted laws to restrict the entry of Turks Islanders. They also began arresting and deporting those already here, especially from Inagua. At the time, many of these migrants were considered opposition supporters. However, as Tinker notes, "although Turks & Caicos Islanders constitute the second largest West Indian immigrant group in the Bahamas, their assimilation is so complete as to make them virtually indistinguishable from the average Bahamian." Bahamian intolerance towards Haitians "is primarily an expression of fear that overwhelming numbers of Haitian immigrants will eventually supplant Bahamian culture," Tinker says. "Equally threatening to the average Bahamian are the increasing demands that Haitians place on social institutions." He argues that Bahamian leaders - instead of fostering assimilation into a pluralistic society - have produced a society of separate and unequal ethnic groups. This is clearly demonstrated by the social inclusion of Turks Islanders and the social exclusion of Haitians. In his summation, Tinker reiterates the fact that all Bahamians are descendants of immigrants, noting that "The balance of power may eventually, and perhaps irrevocably, shift towards dominance by present-day minorities. Bahamian lawmakers must begin the process of assimilating all West Indian migrants - including Haitians - into all aspects of national development." Larry Smith writes a column called "Tough Call" every Wednesday for the Bahamas Nassau Tribune. A former reporter and editor, he now operates a communications agency in Nassau -http://www.bahamasmedia.com. He also blogs at Bahamapundit.